Meet near Plaza de Espana in central Madrid in the morning to hop aboard a comfortable coach and make your way to Pedraza, a historic city located about 1.5 hours north. One of Spain's most beautiful walled medieval villages, Pedraza is home to mazes of narrow cobblestone streets just waiting to be discovered. Walking along the narrow streets with your guide, you’ll feel as if you’ve been transported back in time. Learn about the unique history of this carefully preserved town as you admire rustic buildings and emblazoned houses. Head to a typical Spanish tapas restaurant to enjoy a glass of local wine paired with some tapas such as pan con tomate (bread with tomato spread), tortilla Española and serrano ham croquetas (fried, breaded roll). Then, it’s off to Segovia! A scenic 45-minute drive will take you to the capital of the Segovia Province, famous for its well-preserved Roman aqueduct that runs 10 miles (16 km) long. As you’ll learn on your guided walking tour, Segovia has hosted several kings of the Kingdom of Castile, one of the medieval kingdoms of the Iberian Peninsula. Due to its important royal heritage, this city preserves one of the most important medieval groups of buildings in Spain. 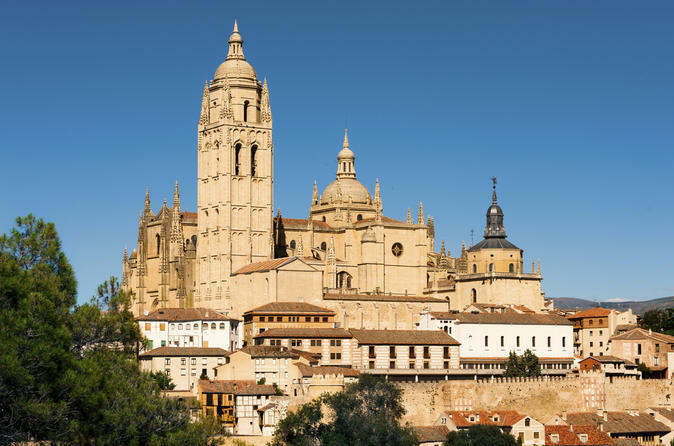 Enter Segovia Cathedral and marvel at the elegant interior. Known as ‘The Lady of Cathedrals,’ this was the last Gothic cathedral built in Spain, and is considered the masterpiece of Basque-Castilian Gothic architecture. At midday, you’ll have time for some lunch. Depending on the option you select, you can have lunch on your own or enjoy a provided lunch of typical Spanish specialties (see sample menu below). Continue to the Alcázar of Segovia (Segovia Castle), one of the most spectacular and iconic castles in the country. Located in Old Town, the Alcázar of Segovia is nestled in a beautiful setting, rising out of a rocky crag above the Eresma and Clamores Rivers near the Guadarrama Mountains. Explore the castle's interior as you learn about the history of the Alcázar, which was originally built as a fortress but has served as a royal palace, a state prison, a Royal Artillery College and a military academy since then. Because of its distinctive shape, the castle is one of the inspirations for Walt Disney's Cinderella Castle. At the end of your time here, hop back in the coach and relax on the drive back to Madrid.